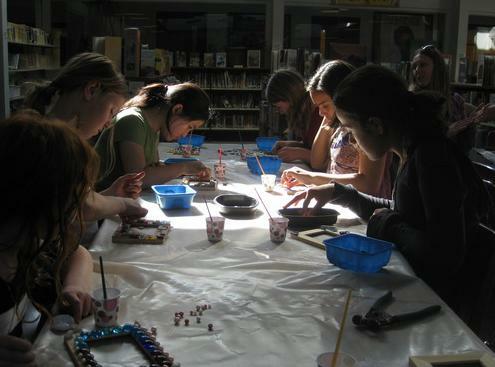 Girl Scout Mobile Mosaic Party! Today I had the pleasure of working with 9 St. Paul Girl Scouts, 2 troupe leaders and one little brother on a mosaic party! Each participant worked on a picture frame that will be a Mother’s Day present for a mom, grandma or other special female relative. The girls worked hard and created some amazing art. As usual, I was completely inspired by the work I saw each participant doing–and found myself eager to go home and work in my own studio. Thanks for the inspiration everyone! I had a blast working with you! 1 Response to Girl Scout Mobile Mosaic Party!